We’re writing right now and we’ve rescued a couple of old songs that we never had a chance to record right at the end of the band. We’re going to get together in San Francisco and get right back to it. We don’t have a label yet, and we haven’t booked any studio time. We’re just dipping our toes and taking it one step at a time. Jawbreaker has announced some new tour dates. Blake Schwarzenbach of Jawbreaker talks about the band potentially recording new music on the latest episode of the Going Off Track podcast. Jawbreaker are featured in a new episode of Amoeba Records’ “What’s in My Bag?” series. Blake Schwarzenbach of Jawbreaker will be appearing at a live taping of the Going Off Track Podcast on March 16th at the Knitting Factory in New York City. Jawbreaker’s storage unit in California was broken into and burglarized. A message from the band detailing what has gone missing can be found below. Jawbreaker have announced a string of shows on both coasts. Jawbreaker have released a remixed and remastered version of their first demo. Jawbreaker are auctioning off limited signed posters for charity. Hayley Williams of Paramore posted up a little video of her performing “Accident Prone” by Jawbreaker on Twitter. Update: I extracted the audio from the video and cleaned it up just a little if you’d like an MP3 copy. Another highlight of the Q&A: Blake said Jawbreaker is “trying to” write new music, and while it doesn’t seem like we should hold our breath (this is a band who took 21 years to reunite, after all), he certainly didn’t rule out a new Jawbreaker album, and seemed like he would be excited if there was one. Jawbreaker’s recent show in San Francisco was recorded and shared on YouTube by BayAreaPunkShows. On paper, Jawbreaker’s show at Rickshaw Stop seemed like a dream. It marked the band’s first headlining show in 21 years in their hometown of San Francisco, no less, at a 400-cap venue. Two local, since-defunct ‘90s punk bands — Monsula and Nuisance — opened. Jawbreaker kept to their DIY roots to a certain extent, opening it up to all ages and selling tickets for $20 with an intense anti-scalper will-call pick-up. For a band that swore it would never reunite, but then announced it would indeed reunite at Riot Fest 2017, performing a proper set in the small-sized venue setting they never broke out of during their career seemed as good as it could get. Yet somehow, Jawbreaker exceeded that. Blake Schwarzenbach of Jawbreaker is on the first episode of the Missing Words podcast. In our premiere episode, we discuss the relationship between nostalgia, reunions, and coming back to artistic creations after quite some time during these not-so-optimistic times. Why exactly do certain records get dismissed by one generation only to find a whole new one appreciating it for different reasons? Why do we want bands to come back so we can experience something we may have missed being a part of? 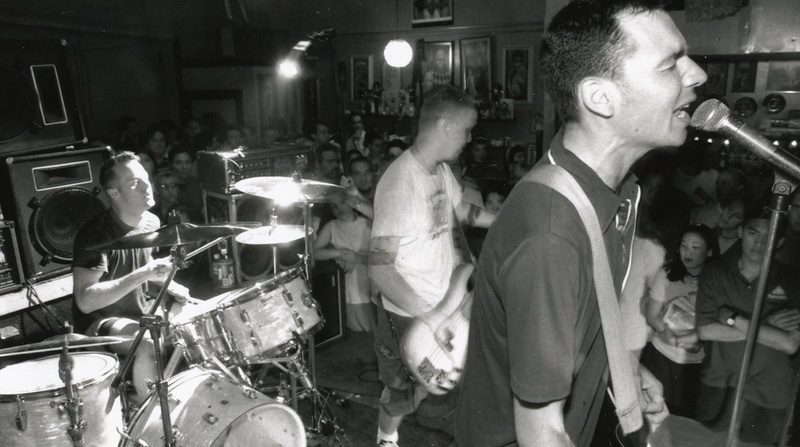 Some videos from Jawbreaker’s first show in 21 years have appeared online. You can check out a few of those with the seven song setlist below. Don’t Break Down: A Film About Jawbreaker will premiere on August 11th. You can check out a new trailer on Vimeo. Jawbreaker will be releasing a new documentary called Don’t Break Down: A Film About Jawbreaker in the near future. Today they’ve shared a clip from the film. Adam Pfahler of Jawbreaker did a Q&A with Giant Robot last month to talk about the band and even hinted at the possibility of a reunion someday (around the 41 minute mark). A fan shot video of Beach Slang covering “Boxcar” live with Jawbreaker drummer Adam Pfahler has shown up on YouTube.